The above observations have arisen from the latest scandal to hit the Congress Government. It concerns the reported actions by the present Government to defreeze the millions of dollars accounts of Quatrocchi (an Italian businessman) which had been frozen by the British Government at the request of an earlier Indian Government as ill-gotten gains in commissions from the infamous Bofors deal during the regime of the Rajiv Gandhi Government. Quatrocchi is reported to have been a close family friend of Sonia Gandhi, the present Chairperson of the UPA, the ruling Congress Party coalition. Readers can see the full details of this long standing controversy in the Indian media which today abounds in such reports. Coming back to the main topic of Dr Manmohan Singh's image, it is unfortunate that his image as an upright man is taking a beating by default both in the Indian media and the Indian people at large. Nearly two years back when Dr Manmohan Singh was propelled into the office of India's Prime Minister, as a result of a strange set of circumstances, India at large, overwhelmingly welcomed his appointment. They welcomed him on the strength of his personal reputation as an upright, honest and self effacing gentleman, a renowned economist with rich credentials and who had distinguished himself as India's Finance Minister in the Narasimha Rao Government in the first half of the 1990s. It is unfortunate that today Dr Manmohan Singh's image as India's Prime Minister is taking a beating as a result of a long line of cumulative lapses that stand heaped on his shoulders as a result of Congress Party's political compulsions to stay in power and its protective compulsions to insulate the Gandhi family from the controversies of the past. The Indian media's oft repeated refrain today is that while Dr Manmohan Singh adorns the office of the Prime Minister he has no powers of the Prime Minister as all important domestic political decisions of consequence are cleared by the Chairperson of the UPA, Mrs Sonia Gandhi. How has all this come about? Why is the Indian Prime Minister's image under question? It all began initially at the time of the formation of the government in 2004. The Cabinet included a big number of tainted Ministers who were facing corruption charges. Not only Dr Manmohan Singh had to accept these tainted Ministers in his Cabinet on orders from his party but he had to defend their inclusion on grounds which carried no conviction ' morally or logically. This was followed by the farcical dramas of removing non-Congress Governors from States and the politically immoral and legally questionable actions of Congress Governors to pre-empt the formation of opposition party governments in Jharkhand and Bihar. In the latter, the Supreme Court had to pass severe strictures on the Governor in an interim order and the final judgment should have come by now. In quick succession, thereafter, have followed the scandals of the Volcker Report oil scam, the telephone tapping scandal and now the resurfacing of the Bofors scandal. The main criticism being leveled against the Prime Minister is that he cannot keep on shielding the corrupt in his Government, or the misdoings of the Congress Party or the use of the state machinery and particularly the investigating agencies like the CBI as fall guys to bail out the Congress Ministers who were complicit in the wrong doings as it has happened in the Quatrocchi case of the Bofors scandal. Some argue that since Dr Manmohan Singh has privately indicated that he is not interested in a second term as Prime Minister and therefore there in no lure of the office, what prevents him from taking an upright stand against corruption, unconstitutional acts and shielding the guilty. In the Bihar case it was then reported that Dr Manmohan Singh was contemplating resignation in case strictures were passed against the government . 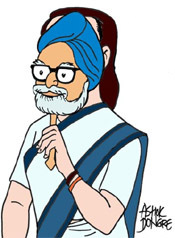 Admittedly, Dr Manmohan Singh is not a political creature of the Congress Party and hence the Indian people both urban and rural had high hopes that he in keeping with his own personal standards of integrity, he would set high standards of integrity in India's political governance and morality in political functioning. That does not seem to be coming as of now and hence the disappointment and the painful observations in the media quoted above. Dr Manmohan Singh himself, and only himself, can arrest the beating that his image is taking by default. He can stand up politically to be counted and assert himself or forsake the political company that he has adopted or that has adopted him. In both cases he would do himself and India proud.